Sea-To-Sea Route Map Disclaimer:The path here (as hiked in sections by Nimblewill Nomad) was created by connecting certain existing trails/roads. As shown, this amalgamation forms a continuous transcontinental route, from the Atlantic to the Pacific, as it tracks the better part of a trail known as the Sea-To-Sea Route. It should be noted, however, that variances from the recognized Sea-to-Sea Route do exist. For more information, please visit the website of Ron Strickland, Sea-To-Sea Route founder. The Sea-to-Sea Route (C2C) is an amalgamation of existing trails, much like the Eastern Continental Trail (ECT). It was first envisioned byRon Strickland back in 1996. Strickland is founder of the Pacific Northwest Trail (PNT) now one of our three new National Scenic Trails. Early on Strickland realized that once his trail was complete, it would provide the missing link in a system of trails connected such that hikers could trek the entire continent, from the Atlantic to the Pacific. He also realized that a trail high up in our northern tier of states would be much more rugged than the American Discovery Trail (the other transcontinental trail route), as the C2C would traverse some of the most scenic of America’s mountainous terrain. Strickland’s concept struck a chord and kindled a passion in the heart of one Andy Skurka, who, on August 6, 2004, set out to thru-hike the C2C. 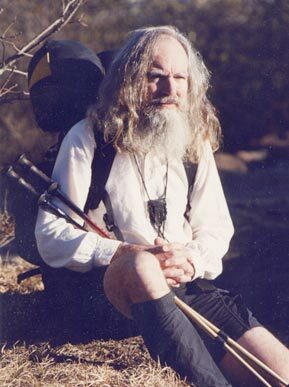 Skurka trekked for 11 months, nearly 8,000 miles, an incredible feat of endurance. On July 10, 2005, the final day for Skurka, the two celebrated together at Cape Alava, Washington. On that day, Strickland’s dream became reality. To provide continuity for the C2C Route, two connecting roadwalks are currently required. One links the Long Trail to the North Country Trail (a short distance) through Vermont and New York. The other hooks the North Country Trail to the Continental Divide Trail (a very long distance) through North Dakota and Montana. The amalgamation of long-distance trails, this concept, as exists with both the C2C and the ECT, holds great potential (see detailed map), as the idea extends the horizon toward a much more far-reaching goal, that being to ultimately interconnect our (now) 11 National Scenic Trails. This grand vision (of linking all long trails) will encourage not only unity of purpose within the National Scenic Trails system, but in addition, will energize those volunteers who unselfishly give of their valuable time and resources in the ongoing effort to satisfy man’s instinctive desire to—connect with *Nature. Thus, by trekking along the ECT, then the C2C, far-distant trails such as the Florida and the Pacific Crest, those trails can now be interconnected. Is this not a beautiful thing! Want to start in Key West and hike to the Mexican Border in California? Well, come on; the trail’s there—Sure it is; Nimblewill’s hiked it! Ah, and again, starting on the Florida Trail, it’s now possible to hike to/through 29 of our lower 48 United States—all made possible by two trails, the ECT and the C2C, trails not represented (let alone recognized) by any organization or authority! Again, Nimblewill’s hiked them; so can you! Throughout the hiking community, folks seeking the trail tend to stay the narrow, canopied path. Nimblewill’s labeled them “The Green Tunnel Crowd.” So, guess it just stands to reason that those who plan and create our trails, those folks tend to be single-trackers too. They strive to keep their paths as far away as possible from even the slightest semblance of a passable road. Those planners—Ha, well, they could sure be looked at as having a “One Track Mind” (no disparage intended). So, makes sense then, that planners looking to create the ultimate C2C Route would frown big-time on ever taking to the highways and byways. Their plan, as how to close the gap, near a staggering 900 miles between the North Country and Continental Divide Trail(s), is to hack out a single-track path across the sprawling upper Great Plains. Looking at Nomad’s itinerary below, you’ll see only a 24-mile gap between these two trails. And how can that be, you ask? Well, had he trekked past Lake Sakakawea State Park during his outbound Lewis and Clark National Historic Trail (L&CNHT) Odyssey back in 2004 (the 200th anniversary of their expedition), rather than the route through Knife River Indian Villages, that gap wouldn’t even exist, as the L&CNHT also passes by Lake Sak. Anyway, instead of the huge gap trail planners say is out there, in Nimblewill’s mind (since he doesn’t continually seek the narrow, green tunnel), there’s no gap at all. Below is Nimblewill Nomad’s itinerary. Listed are the dates and mileages for the trails Nimblewill trekked during his (section) hike o’er the C2C—385 days, 8457 miles. Clicking any one of them will take you to that specific Odyssey, where you’ll find the respective journal dates/entries. Also, on those pages you can view some spectacular photos and videos. We’re sure you’ll discover Nimblewill Nomad’s C2C trek to be a remarkable adventure. So, why not come along; Nomad would certainly enjoy your company!